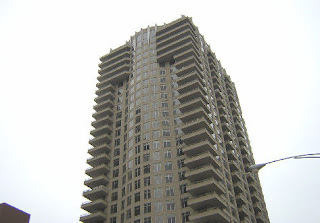 This 30 story Near North Side condominium building was built in 2003 and contains 187 units. According to the Northern Illinois MLS the median sales price in this complex in the twelve months ending November 19, 2008 was $610,000.00 with 200 days on the market, with 14 sales. Median prices have decreased -0.81% , sales volume has increased +27.27% and marketing times have increased +14.94% over the previous twelve months. In the twelve months ending November 19, 2007 the median sales price was $615,000.00 with 174 days on the market, with 11 sales. There are currently 14 active listings in this complex with prices from $410,000.00 to $3,400,000.00. At the current level of absorption this represents approximately one year of available inventory. Nice post on Lake Shore Drive.